(1) Take your Office’s Green Footprint: The website TheGreenOffice.com, an online retailer specializing in green office products, makes available a free Office Footprint Calculator to gauge what kind of effect you and your co-workers are having on the environment and identify how to make improvements. (2) Save Trees: The average office worker uses 10,000 sheets of copy paper a year. Refrain from printing when you can, use both sides of a sheet, and recycle so that the recycling industry will have raw material. (3) Power Down: Artificial lighting accounts for almost half of all office electricity use. Turn off lights that are not being used. Better yet, install motion sensors that do it automatically when no one is in the room. Also, shut down computers overnight, and set them to go into sleep mode when sitting idle. (4) Minimize E-Waste: Upgrade or repair the office computers instead of junking them. So-called “e-waste”—toxin-leaching computers and electronics—is a huge problem all over the world now. (5) Telecommute: Encourage workers to work at home when possible to save car trips. For those who must come to the office, encourage bicycling if it is safe. Also some firms now subsidize employee public transit costs to discourage driving. And online video tools like Skype can help cut down on business trips. (6) Green Screen Your Suppliers: Ask your vendors how they are greening their operations. Just posing the question can start them thinking, the precursor to action. Demand recycled paper and soy-based inks from your printers, and buy only green office supplies—which are now widely available. (7) Clean Greener: Make sure your cleaning service uses non-toxic, green friendly products—if they don’t, offer to supply them—so that you can breathe easy when you’re trying to get your own work done. 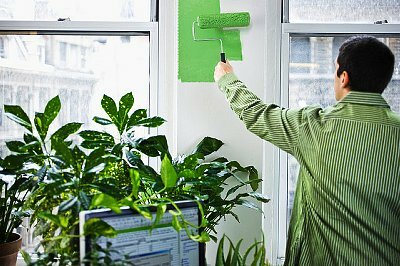 (8) Eco-Renovate: If you need to renovate or upgrade anything, greenest options abound, including non-toxic paints, natural fiber carpeting, energy efficient windows and Energy Star-rated office equipment. (9) Drink Tap Water: Having big jugs of water lugged in and out every week by the bottle water company is not only unnecessary but a big waste of energy. Most tap water is safe to drink; if yours isn’t or you’re not sure, put filters on the kitchen spouts or buy filtered water pitchers and keep them in the office fridge. (10) Put Your Heads Together: Form a committee to organize and monitor your office’s green practices, to ensure that your office’s green goals don’t fall away if one or two committed employees move on, and to reinforce the importance of doing the right thing across the organization. NextWhat’s So Bad About Cotton? What Caused Solar Company Solyndra to Fail?